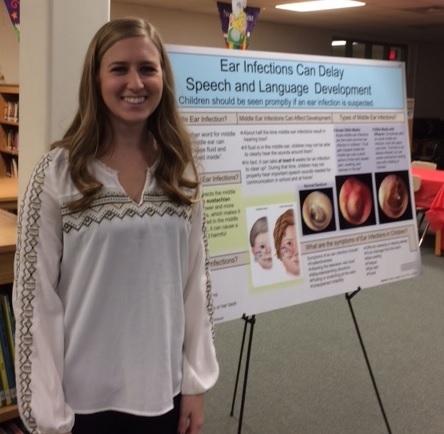 Mennonite College of Nursing was joined by the Hearing Loss Prevention (HLP) Laboratory for the Fox Creek Elementary Health Fair in Bloomington. The event was well attended by children and their families. Undergraduate students from the Mennonite College of Nursing and the department of Communication Sciences and Disorders HLP Lab thankfully volunteered for a few hours in the evening to serve their community, and provide some health-education support. The MCN and HLP Laboratory shared a space in the school library to present health information to families. Volunteers from ISU included six CSD students, an Audiologist, and the Mennonite College of Nursing team with 20 Student Nurse Association nursing students, 14 America’s Promise nursing students, six additional nurses, and six members of the ISU Health Education Honor Society. 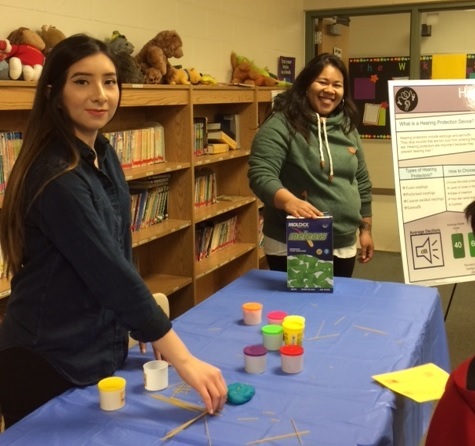 Families participated in a demonstration designed to educate students about the effects of hazardous noise on the hair cells in the inner ear using Play-Doh and spaghetti noodles. Children discovered, first hand, how unprotected noise exposure is capable of causing irreversible damage to their hearing. Several poster presentations, created by HLP Lab students, displayed information about hearing protection, ear canal hygiene, and the effects of ear infections on speech and language development in children. Various hearing screenings were also available for parents and children. In about two hours, 24 children participated in a number of fun activities at the Fox Creek Elementary Health Fair.